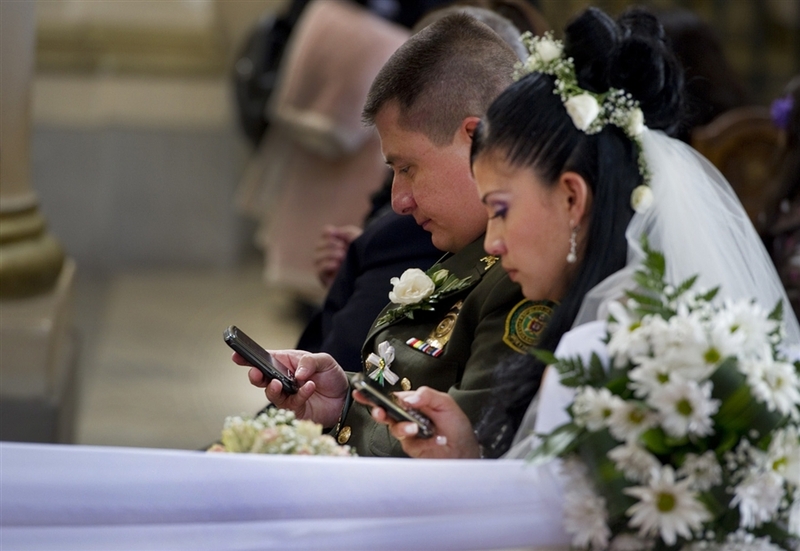 I just read this article, which reported on an emergent trend in which couples ask guests to put away their cell phones during wedding ceremonies: http://www.metro.us/newyork/lifestyle/2013/07/28/for-some-couples-tweeting-wedding-pics-is-an-idont/. Where do I stand? I am WAY in favor of this from a manners point of view. 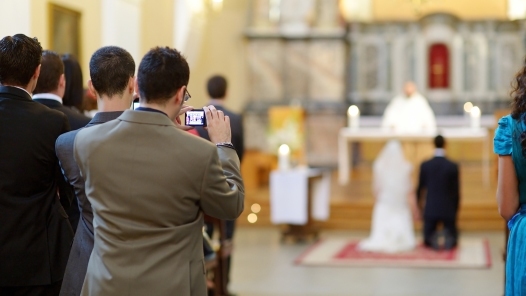 Firstly, if you are texting or tweeting during someone’s wedding, stop immediately. I share a sentiment along these lines with my students: in my class, as at a wedding, you are in an environment where you don’t need to engage with a virtual world because you should be paying attention to what is going on IN THE REAL WORLD SURROUNDING YOU. And I know people have the ability to multi-task, and I multi-task all the time, blah, blah, blah. But just because you can do two things at once doesn’t always mean you should, and it doesn’t mean that one of the things you’re doing doesn’t suffer for the attention you’re directing elsewhere. And if one of your regularly undertaken secondary tasks is texting, then generally speaking, you are being rude. Furthermore, if you expect that you’ll find yourself bored at someone’s wedding and thus *need* your phone, I suggest you a) learn how to entertain yourself with thoughts; or b) make the grown-up decision not to attend this particular wedding. Sidenote: if you are so bored at your OWN wedding that you must text, you have bigger problems than I’m either equipped or willing to advise you with. If you were planning on taking pictures with your phone, that’s nice, I guess, but I’m still okay with bride & groom telling you to put your phone away. Are those pictures really going to be that good? And, really, what are you going to do with them? And does the couple not have someone else to do this for them? Full disclosure: I’m sort of a picture grinch. I operate on a less is more perspective in the world of immediate visual documentation, so I would never defend the point of view that one must have one’s phone because one must be able to take a picture. I digress. I’m also in favor of this from the point of view of the bride and groom wanting to protect some measure of their privacy as well as some measure of their agency as the central figures celebrating the wedding. People have complicated relationships to social media, and individuals should respect the varying degrees to which others may engage with the virtual world. On the one hand, I suppose there are people who measure the success of their lives’ milestones by the numbers of pictures friends post of them and the number of comments or likes those pictures receive. As the “IDon’t” article suggests, some celebrants go so far as to create hashtags for guests to use so that their physical community can also get together virtually. That’s fine. But I respect the desire to enjoy the moment of the wedding in its actual moment as well as the effort to have guests do the same. From my point of view, the time taken to chronicle the great time you’re having can take away from the greater fun you could actually be having were you to focus on fun rather than documentation of said fun (that makes sense, yes?). There are those who are part of the social media world without being enmeshed in it. They may maintain profiles or presences without a desire to document every moment (or have every moment documented for them by [admittedly well-meaning] others). And it may be, for those social media dabblers rather than full-time residents, that the wedding community of their own creation, carefully selected from the competing and often contradictory worlds of family and coworkers and close friends (and the sub-worlds of childhood friends and college friends and adulthood friends and so on) is the community they want as primary witness to their wedding day. The neighbor from two apartment complexes ago or the yoga instructor from the last gym or the bartender from the college waitressing job – all people who’ve made their way to someone’s weird Facebook world – maybe don’t need to know about the wedding in real time. I know there are those who would say “Then don’t be FB friends with those people,” but I think a person preserves the right to see as separate the life s/he is actually living and the one s/he maintains online. Maybe there are those who would say I’m imagining a false dichotomy in seeing the two as separate, but I don’t think that has to be the case, and I think we maintain the right to understand those worlds as we wish. For all the times that weddings are regarded as conventional and conformist, staid and predictable, I argue that these celebrations allow for engagement with current trends and contemporary social, cultural, and political issues. Even the world of wedding advice and etiquette reflects the wedding’s relevance. Two letters recently submitted to the New York Times Wedding Q & A highlight this point: http://www.nytimes.com/2013/06/02/fashion/weddings/questions-on-wedding-etiquette.html?_r=0. Rather than blindly following the path laid before them, sensitivity to questions about sexuality, personal preference, and economic partnership shape men and women’s relationships to weddings, their participants, and each other.